Within walking distance to the vibrant and eclectic neighborhood of Hillcrest, Mission Hills is a hilly, affluent enclave overlooking downtown San Diego, Old Town and San Diego Bay. Developed in the early 20th century, the neighborhood still boasts many homes from that era that have been carefully restored and maintained. During the 1950s and ‘60s, well-known architects and developers built Mid-Century Modern homes in the area as well. Northwest of Balboa Park and south of Mission Valley, Hillcrest is a rather densely populated, socially- and gender-diverse neighborhood chock full of locally-owned businesses such as trendy restaurants and cafes, bars and clubs, thrift stores and more. An older, tree-studded neighborhood that has been gentrified and rehabbed, it is known for its Craftsman homes and Mid-Century Modern apartment buildings. 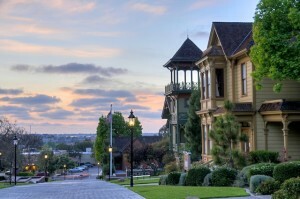 commercial districts, North Park has become a community blessedwith many architectural styles from several eras, including California and Craftsman cottages and bungalows. Many were designed by noted designer and builder David Owen Dryden who has an official Historic District named in his honor. 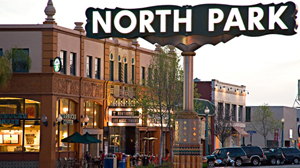 In fact, North Park has a very active North Park Historical Society. The community has evolved over the last few years and is now a bastion of artists, the arts and culture. Forbes and the Los Angeles Times have noted its impressive collection of art galleries, trendy bars and restaurants, boutiques and microbreweries. The weekly Farmers Market has been listed as one of the top 40 in the U.S. Its “Ray at Night” monthly Ray Street Arts District gallery walk is the largest and longest running event of its kind in San Diego’s history.